MusicXML was designed so that a single symbolic music file created in a program chosen by the user could be used in another program also chosen by the user. At this writing, 29 applications were shipping with MusicXML support, and another 21 applications had announced support in beta or prototype versions. Not all implementations are as extensive as those of Finale and Sibelius. Some read the format but do not write it, while others have the reverse capability. A few, like Finale and Sibelius, support operations in both directions. The read-only programs are mainly related to score preparation and viewing. 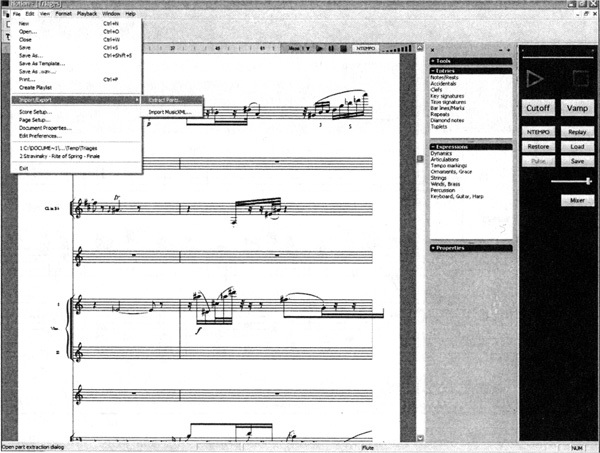 They include NOTION (Figure 1.2), MuseBook Score (Figure 1.4), OrganMuse, Overture 4, capella playAlong, SipXML-2Score (Kloe, 2005), MusicEase, Turandot, Igor Engraver, and Personal Composer. The write-only programs are mainly related to music acquisition and include SharpEye Music Reader (Figure 1.3), PhotoScore Professional, SCOREMAKER, and Java Music Specification Language (JMSL; see Didkovsky, 2004). Bidirectional programs include Harmony Assistant (a shareware program for music arranging) and several programs used by guitarists. File transfer from Finale to other kinds of programs also occurs. Guitar music editions have been transferred from Finale to SCORE using the Dolet for Finale plug-in and SipXML (the MusicXML 1.0 predecessor of the SipXML-2Score program). Other companies have used MusicXML to transfer music from Finale to an in-house music typesetting software system.